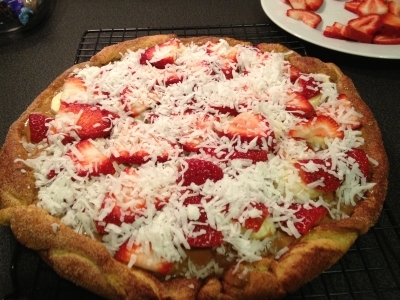 It’s about time for a Spring Dessert pizza. This is one that I came up with to entice the kids to eat some fresh fruit. 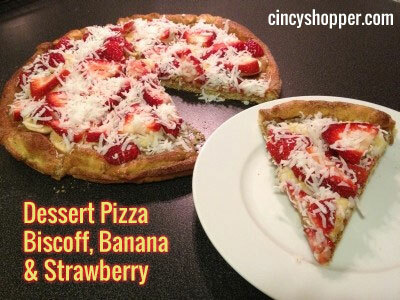 Cinnamon sugar on the crust, Biscoff for sauce, bananas and strawberries for toppings and Shredded Coconut as our cheese. 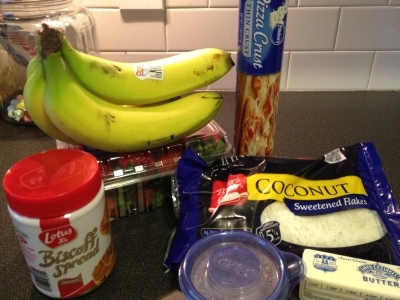 This is a nice simple recipe to take advantage of currently low prices on fresh fruit. Spread your dough onto a 12″ round pizza pan. 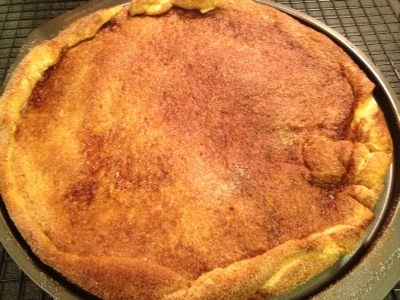 Brush with melted butter and sprinkle with the Cinnamon Sugar mixture to give the crust a sweet dessert taste and place in a 400 oven for about 10 minutes. When the crust comes out we want it completely baked. We transfer it from the pan to a cooling rack because we want it to stay crisp. While it is still warm we spread the Biscoff Spread around so it will melt and be easier to spread. We then top with our banana slices getting full coverage up to the edge of the crust. Then the strawberry slices on top of and between the banana slices. And finally, top with our coconut to look like cheese. It was a big hit with the family, and the pizza motif encouraged our fruit/veggie haters to give it a try. They’re not convinced yet, but sometimes you have to take baby steps. Spread your dough onto a 12″ round pizza pan. 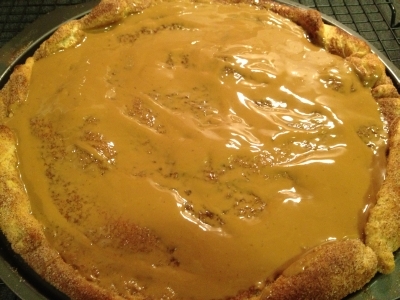 Brush with melted butter and sprinkle with the Cinnamon Sugar mixture to give the crust a sweet dessert taste and place in a 400 oven for about 10 minutes. When the crust comes out we want it completely baked. We transfer it from the pan to a cooling rack because we want it to stay crisp. While it is still warm we spread the Biscoff Spread around so it will melt and be easier to spread. We then top with our banana slices getting full coverage up to the edge of the crust. Then the strawberry slices on top of and between the banana slices. And finally, top with our coconut to look like cheese.